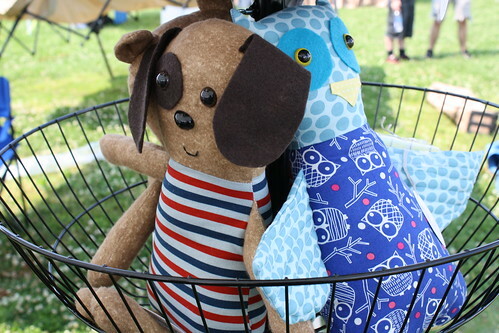 Yesterday was a long, hot day at the Buy Local First Fair, but the many smiling faces I saw made it all OK! I was so happy to be a part of this big day for local businesses in Louisville. 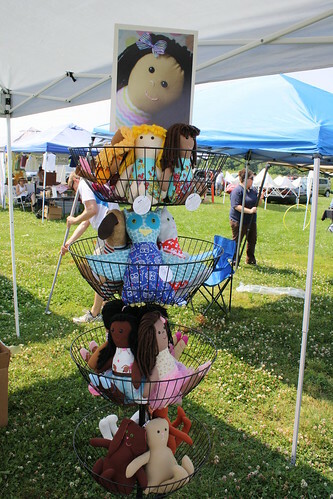 The food, the crafty wares, and the crowds were a pleasant sight! 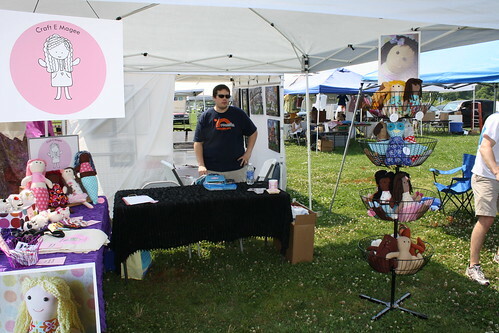 J helped me set up my booth, including my new doll display that I just love! 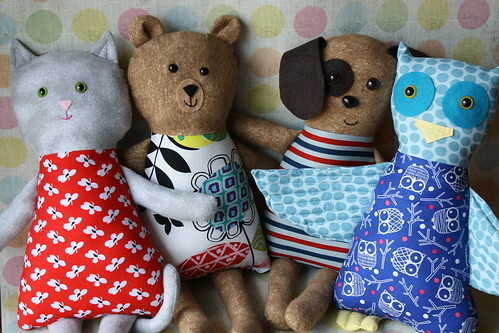 I had some new dolls, including Kit the Cat, Pip the Pup, Hoot the Owl, and Honey the bear! People really loved seeing them. I have re-listed the dolls that I did not sell yesterday in my etsy shop, so be sure to check that out! Cloudy, a photo by E. Magee on Flickr. Meet Cloudy! He's a little plush I made for J based on a sketch he did when we first started dating. 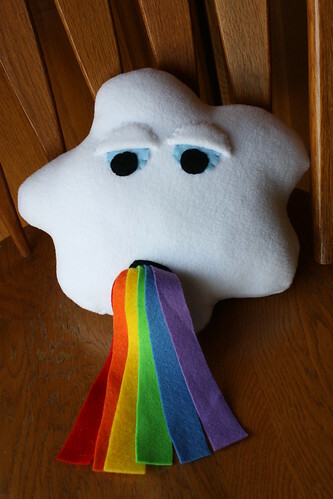 See, little Cloudy is hungover, and he's throwing up rainbows! 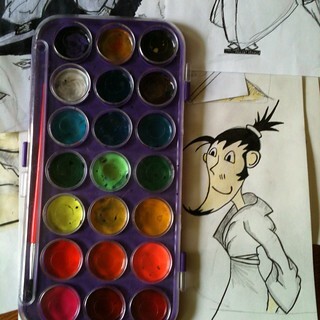 The sketch made me laugh, so I tucked it away. It has since inspired me to make this plush! It is really capturing my mood lately. To me, bright colors are happy, and I am pretty excited for the Buy Local First Fair this Sunday. But Cloudy is also a little sad and feeling sick, which is sort of how I feel today because I lost a special former co-worker this week. She was only 31. I am feeling more than a little blue. 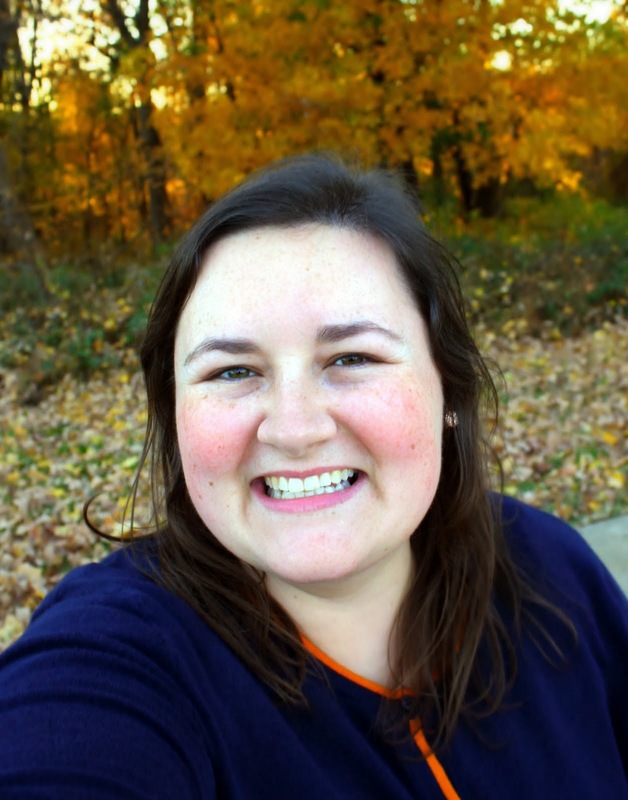 She was so spirited and enthusiastic, and brought lots of Sunshine into my life. 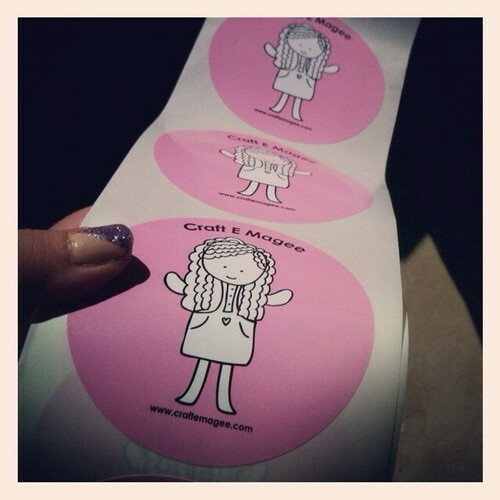 I know that she supported my crafty endeavors, and probably would have come out to the show Sunday! I will definitely miss her. I hope little Cloudy makes you laugh. Even though he's a sad little cloud, he makes me smile, and that is so important right now. Keep Louisville Weird! Come out and support your local peeps!! 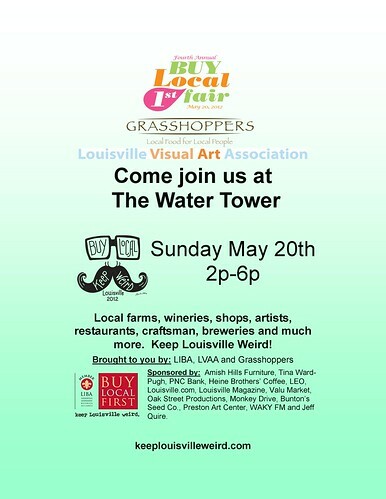 Sunday, May 20 at The Watertower from 2pm-6pm the Louisville Independent Business Association, Grasshoppers Distributing, and the Louisville Visual Arts Association are all partnering to bring you: The Buy Local First Fair, a celebration of locally owned/operated boutiques/shops, galleries, restaurants, breweries and much more. 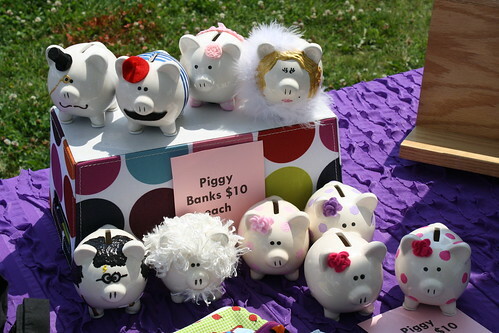 There will be farmers’ market booths, local art, handmade treasures, a variety of delicious food, live music, "Top Chef" competition, a kids area, craft beer and raffle. Sometimes I don't have a lot of time to write long blog posts, but I do love to share as many photos as I can! So, here are some recent instagram pictures that I have taken. 1. 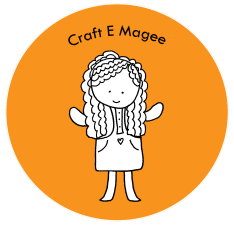 Craft E Magee stickers from Sticker Giant! I love these, and plan to give them away at the Buy Local 1st Fair in Louisville on May 20. 2. 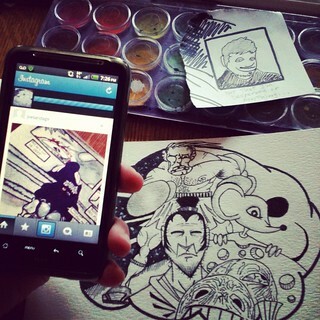 Helping J post pictures on his instagram. 4. 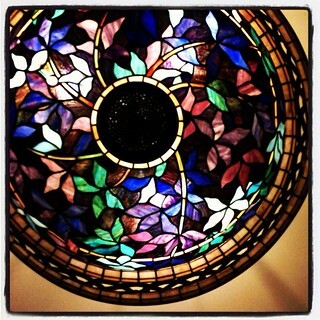 Pretty colors in the ceiling lamp. 5. 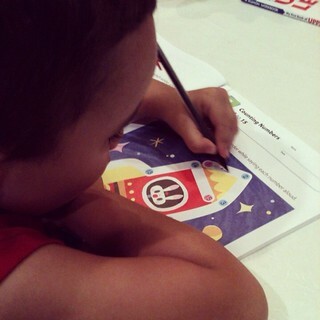 My nephew practicing his writing to get ready for kindergarten! 6. 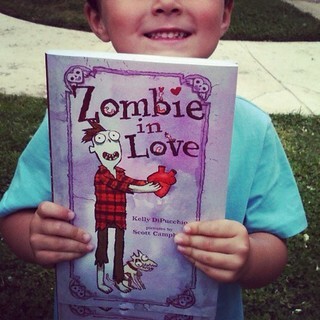 My nephew's book choice from the local bookstore, "Zombie in Love." It's a very cute book. 7. 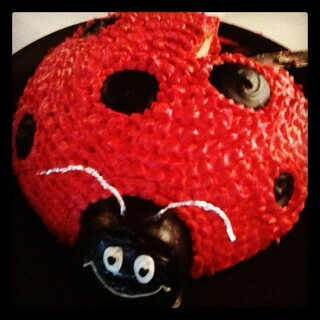 Ladybug birthday cake for a friend's daughter's 1st birthday. 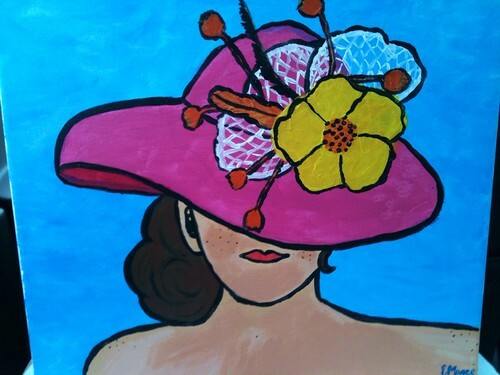 Today is the 138th running of The Kentucky Derby! Unless you've been to Louisville, you may not realize what a big deal the day is to locals, but we love it. It's a special time of year when our city and state gain national attention. I love Louisville and am so proud to be celebrating our Derby holiday today!